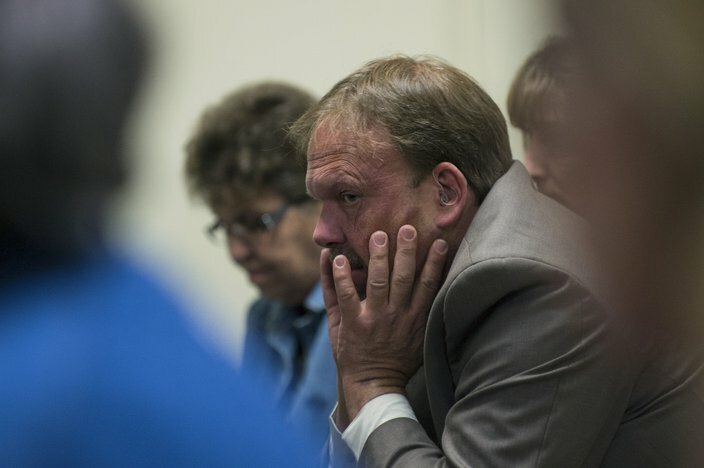 David "DJ" Creato reacts as footage is shown of an interview revealing his son was found dead during day three of his murder trial on Wednesday, April 26, 2017, in Camden. A detective with the Camden County Prosecutor's Office testified Wednesday that David "DJ" Creato misled investigators when he told them he hadn't visited Cooper River Park near the day his son's body was found there in October 2015. Michael Rhoads, the lead scene investigator, told the jury that a photo found on Creato's cellphone disproved that assertion and other statements made by Creato to authorities that he had never been to the specific location in the park where his son Brendan's body was found by police. 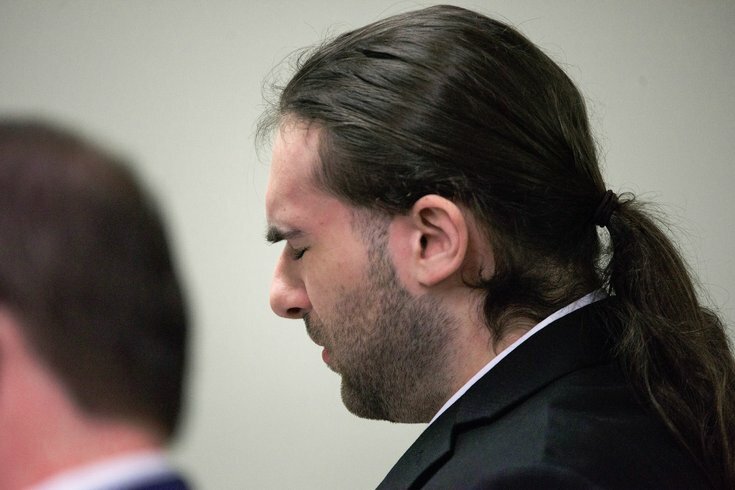 That testimony came on the third day of the murder trial for David "DJ" Creato, who is charged with his three-year-old son's murder. Rhoads' testified about an interview with Creato after the father had reported his son missing in the early morning hours of October 13, 2015. During the interview, Creato marked a map of Cooper River Park to show where he had gone. He also told the detective he had not been to the park recently. But a cellphone photo dated October 11, 2015, with a GPS stamp, indicated his statement was not true, Rhoads testified. The photograph, which features the water of the creek as it meets the river with a bird in the background, was taken 15 yards from where his son's body was found just two days later, the detective told homicide prosecutor Christine Shah. Rhoads was on the witness stand all day. More damaging testimony heard Wednesday centered around a Tumblr post by Creato's former girlfriend, then 17-year-old Julia "Julie" Stensky, whom he met on the online dating service, Tinder. The prosecution has contended that Creato, who was then 21, killed his son in order to continue his romance with Stensky, who had lived in Feasterville, Bucks County. Posting under "Julie's Funny Stuff," Stensky posted a blistering entry labeled "Where we stand now," on September 1, just 10 weeks after she had begun seeing Creato. She was heading to study at Pace University in Manhattan and seemed intent on sorting out issues between the two, particularly Creato's three-year-old son and how Brendan tied him to New Jersey, his ex-girlfriend, Samantha Denoto, and a job with his father's construction company. In the post, which Rhoads read to the court, Stensky bluntly wrote: "The kid's a mistake." She went on, adding Brendan was "not planned, a mistake." Stensky wrote that she did not want to "tie myself down to you and that kid." Then she told Creato there were "solutions out there" – a formal custodial agreement between him and Denoto was mentioned – which would mean "you would barely have to talk to your ex" if only he would get a lawyer and work out "a legit solution." In what sounded like an ultimatum, Stensky wrote that Creato needed to "deal with my decision or I walk out the door." She added, "I think I legit love you," before criticizing Creato's work situation with his father, who had run a remodeling business. Stensky had worked at the business for a time, too, though she did not mention that in the post. In the post read by Rhoads, she wrote, "What the f, dude?" before calling David J. Creato Sr. a "turd." She closed that Tumblr post by writing she had "respect" for Creato for wanting to be in Brendan's life, but said her solution – seeing a lawyer – would enable Creato to remain in his son's life without being so connected to his ex-girlfriend and his family. Stensky gave a formal police statement to police the day Brendan was found dead, returning to Haddon Township that day. What she said was not disclosed in court. She had agreed to a follow-up interview, Rhoads testified, but she hired a lawyer and canceled. Stensky has never been interviewed again, added Rhoads. Though her name was read as a potential witness at the start of the trial, it is unclear if she will actually be called. She apparently dropped out of Pace and joined the Air Force. Before discussing Stensky and the cellphone photo, a videotape was played in court from the interview he had with police the day his son's body was found. The tape showed Creato crying in a police interview room and saying, "So much time has passed." Creato, who lived in the Westmont neighborhood with his toddler son, was not told initially by police that his son's body had been found. A Haddon Township officer is seen and heard assuring Creato that Brendan "will be found" as the father sobs and blows his nose. The child's body, in fact, had already been found. The same Haddon Township police officer soon accused Creato of holding back information. Creato disagreed, then spoke about the locks at his apartment, his son's fear of the dark and his worry that the boy had not yet been found if he had he wandered off. The officer continued leaning on Creato, still not telling him his son is dead. "There is nothing I haven't told you, I just want him to be OK," Creato told his interviewer, eventually adding, "I have nothing to hide." When Rhoads finally entered the interview room in the Haddon Township Police Department, he immediately told Creato that his son's body was found. David 'DJ' Creato, seen here on a video screen played for the jury, reacts to the news of his child's body being found during day three of his trial Wednesday, April 26, 2017, in Camden. "They found your son. He's deceased," said Rhoads evenly, adding his sympathy and telling Creato about where the boy was found in the water. Creato shrieks, "No!" then rapidly repeats the word dozens of times, the video showed. "I love him so much! What happened? Did he drown?" the father asks. "That's what we're trying to find out," Rhoads responds. The moment when he is told is one of the few time Creato has shown emotion, closing his eyes and looking downward. Rhoads then went over details of the accused's life, his employment, where he lived, where his son slept on a sofa in the living room and his relationship with Stensky. Creato is heard during the taped interview openly explaining that Stensky did not like him having a child and that it was a source of ongoing friction. Creato is heard freely admitting to Rhoads that he was "jealous" because his girlfriend, a college student, was spending time with a boy at her college in New York. Rhoads also asked Creato about the locks at the apartment. Creato told him he thinks he locked the deadbolt, but was not certain. He also told the detective that his mother, who had brought the boy to his apartment the night before, told him she had locked the door knob lock as she left. After having Creato sign a consent form, his cellphone was taken for a "forensic extraction" of the data, Rhoads testified. David Creato Sr., looks on during day three of his son's murder trial Wednesday, April 26, 2017, in Camden. During the interview at police headquarters, Creato told Rhoads it was "out of character" for his son to have left their apartment on his own, though the lock was easy to open. He said it was "possible" someone had entered the apartment and taken his son. Creato consented to a DNA examination, as did members of his family, the detective said. The detective said he went to interview Denoto and her boyfriend, Matt Holshue, after finishing the interview with Creato. They also gave DNA samples. Their statement to police were not revealed in court. Court ended for the day before defense lawyer Richard J. Fuschino Jr. could cross-examine Rhoads. Rhoads had begun the day by describing a "reverse 9-1-1 call" – an alert to more than 2,000 landlines notifying residents of Haddon Township that a child was missing. He was soon notified the child's body had been found by a K-9 officer and dog in a creek flowing into the Cooper River. Rhoads described the condition in which the boy was found: clad in pajamas, which were pulled down exposing the boy's rear, his shirt pulled up, exposing the child's back, his feet in clean socks.The prosecution has previously said the child's socks were white, but Rhoads testified Wednesday that their color was green. The detective said the boy was on a rock in the stream, belly down, his face turned to the side. Rhoads said Frank Jackson of the Camden County Medical Examiner's Office showed up after he arrived. Jackson, a Westmont mortician and member of the local fire department which aided in the search, is a medicolegal death investigator. Jackson was not actually on the work schedule that day for the medical examiner's office, but Rhoads did not explain that or how he came to be involved. But the detective did testify that, as the investigator, Jackson was to serve "as the eyes and ears" for the Medical Examiner's Office. Rhoads said he remained at the scene for perhaps 40 minutes as it was photographed and examined. A county detective eventually lifted Brendan's body from the rock, placing it in a bag provided by Jackson, said Rhoads. That happened at about 9:50 a.m., the detective testified. Testimony Wednesday concluded with a phone conversation that Denoto secretly recorded with Creato in November 2015. In it, Creato speaks candidly, talking about advice from his lawyer, how the Haddon Township police officer had treated him the first day, how his spirituality might be misconstrued. The first half of the hour-long recording was of very poor quality, but a transcript of the conversation was provided to the jury. A jury visit to the scene where Brendan Creato's body was found is planned for Thursday afternoon. The trial court judge, John T. Kelly, has, through the presiding judge in the Camden judicial district, barred the media from going to the scene with the jury. The order provided no rationale for the decision. The judge, who has not spoken to the media about the motion, directly addressed the media Wednesday morning, as he has previously done. He asked journalists to be discrete about showing photos from the scene that are presented to the jury. Testimony resumes Thursday morning at 9 a.m. in Kelley's courtroom.